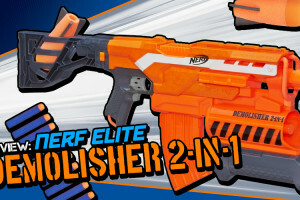 Easily among the most anticipated blasters to have been announced this year, the Nerf Elite Demolisher 2-in-1 is finally available. 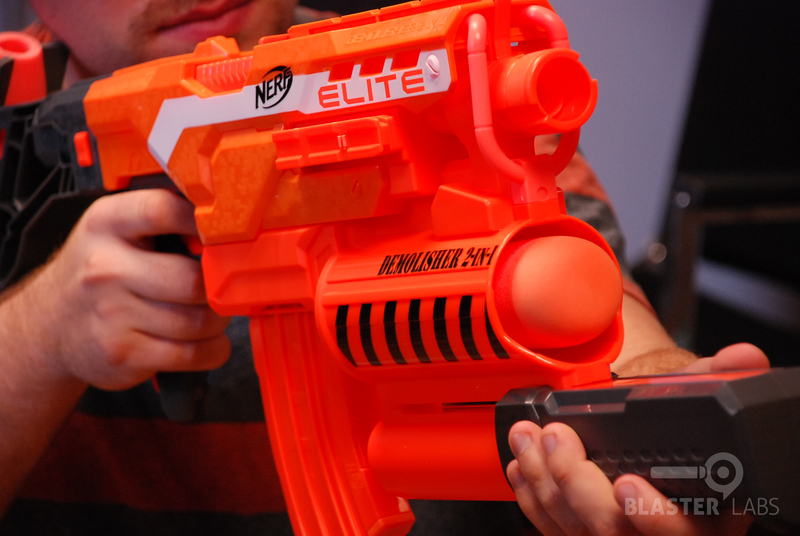 After having played with it at Toy Fair and at the recent Nerf All Access Event, we had a pretty good idea of what to expect, but no formal measurements to back-up our first-hand experiences. 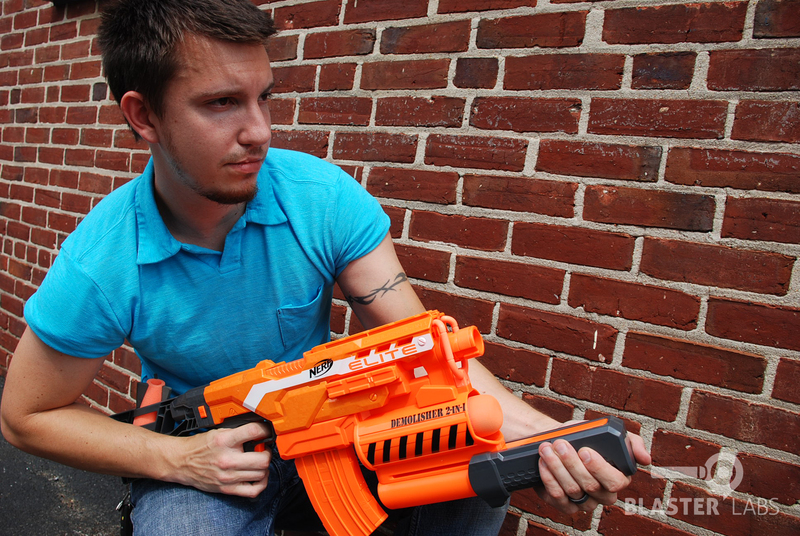 Now we finally have a Demolisher in for testing, and we’re happy to report it mostly lives up to expectations, but not without a few caveats. 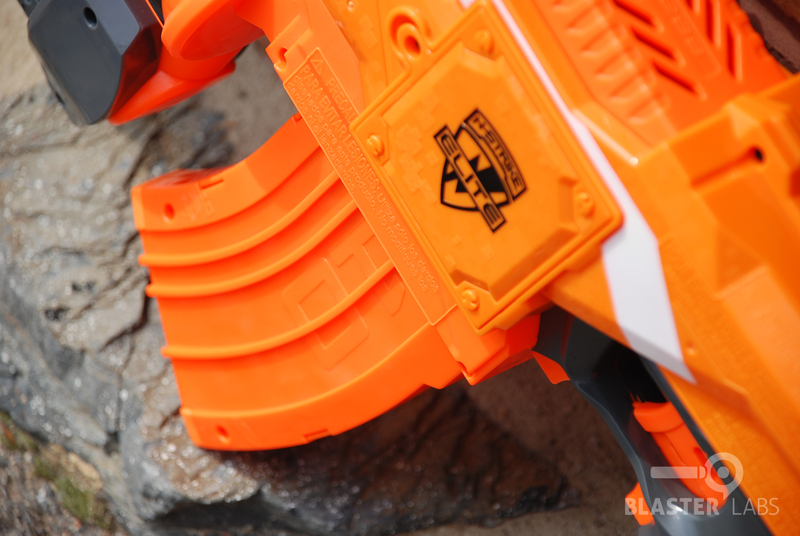 In typical Nerf fashion, the Demolisher comes in a fully enclosed box, but with a small plastic window to show-off one of the new pump-fire missiles alongside a standard Elite dart. It’s a bright, fun package design that is very much in keeping with past Elite box treatments, with high-quality printing and spot UV touches to highlight the product. It feels premium enough, though it doesn’t break any new ground and feels slightly old-school compared to the new BOOMco package designs (and, unfortunately, is getting almost as hard to open). 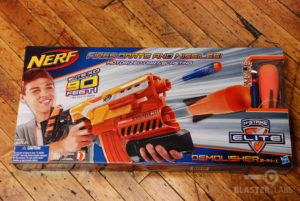 We would also really like to see someone other than a highly-retouched preppy white kid holding the blaster in the main graphic for once (at least on the back of the box image, perhaps?). 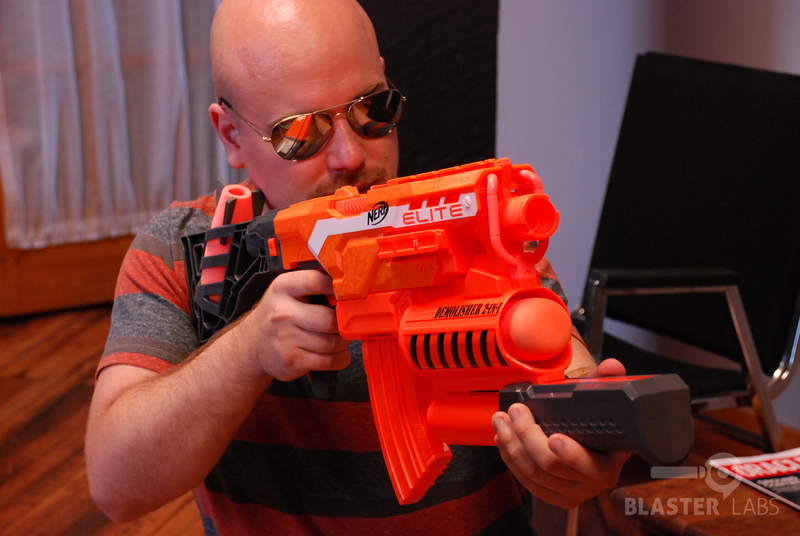 Curiously, on the front of the box there’s a bold “Elite XD Fires Darts up to 90 Feet!” with a much less bold “See back for details” asterisk. 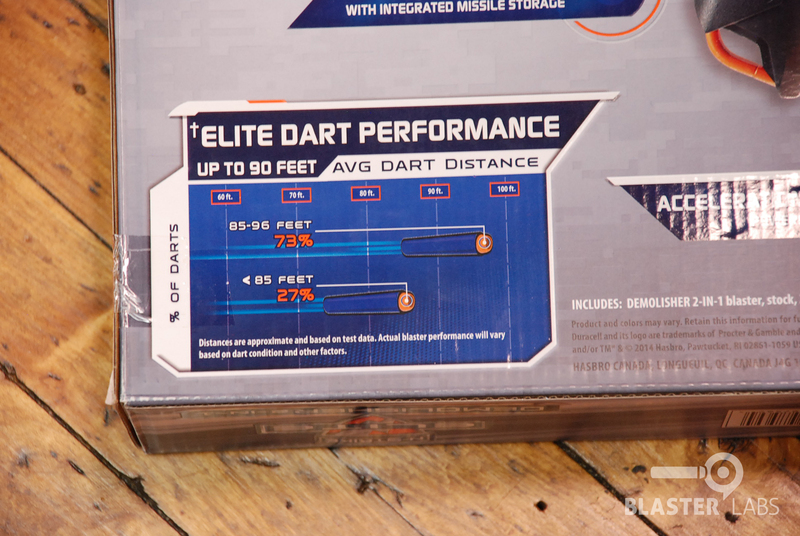 When you turn the box over to see what that’s all about, you discover a graphic showing what Nerf believes to be average dart distances for the Demolisher, which is 73% at 85-95 feet, and 27% at 85 feet or less. We appreciate that they include this graphic to help temper expectations, but find it interesting that they feel the need to do so. Perhaps this is Hasbro lawyers at work, or perhaps there’s more variability in the Demolisher’s performance than some other designs. 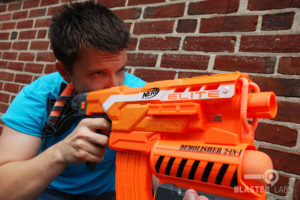 Inside the box is the Demolisher 2-in-1 blaster, a removable stock, 2 Elite Missiles, 10 Elite Darts, and a set of instructions. 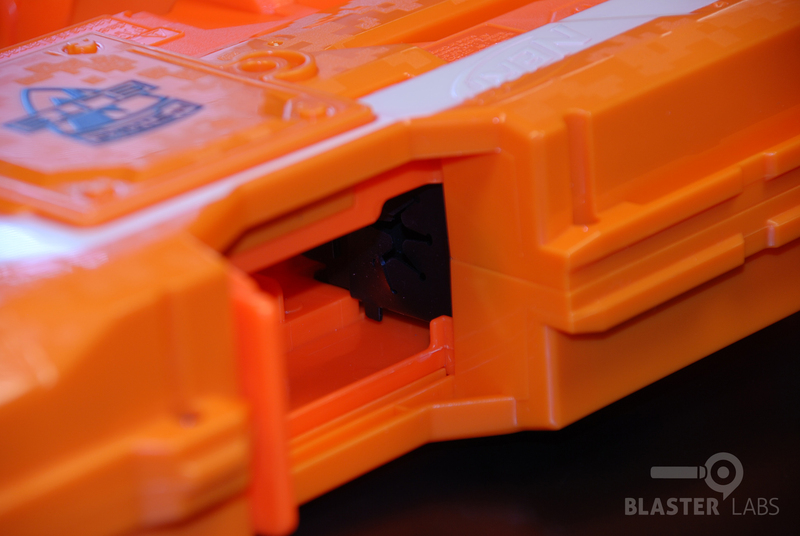 What’s not in the box are the 4, “AA” batteries that are necessary to power-up the Demolisher’s flywheel. 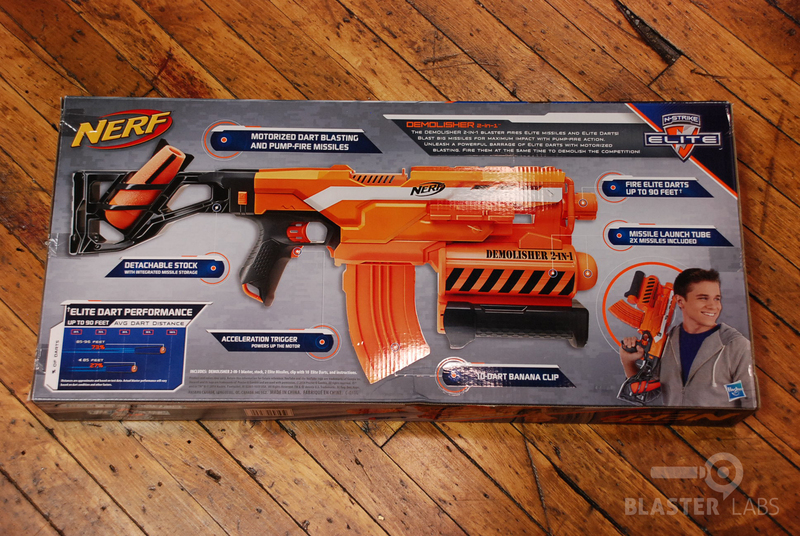 There’s a Duracell image on the front, but sadly, no Duracells actually found in the box (which is in keeping with past battery-powered Nerf products). 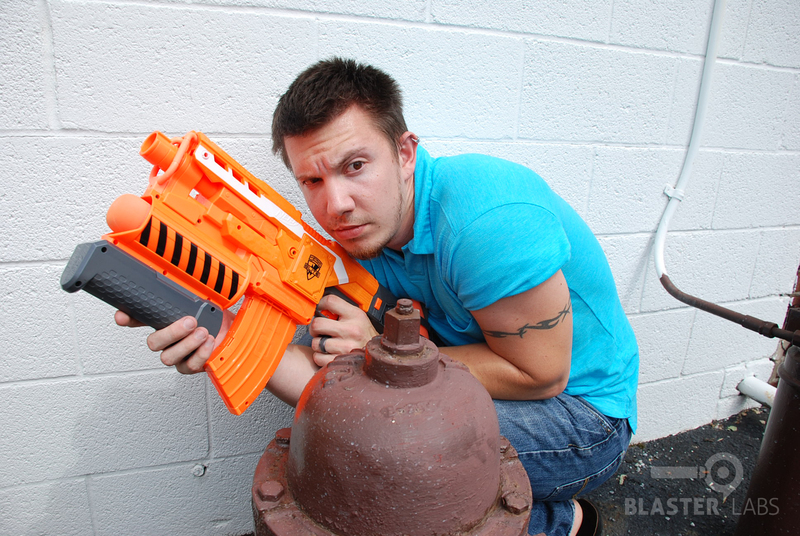 With the shoulder stock attached, the Demolisher is a fairly large blaster that is decidedly front-heavy. 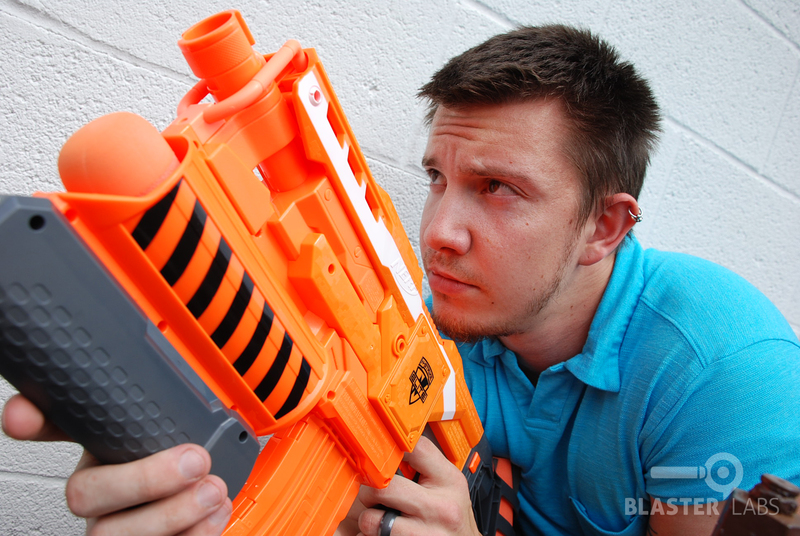 Virtually all of this blaster’s weight is ahead of the primary firing handle, necessitating support in the front. 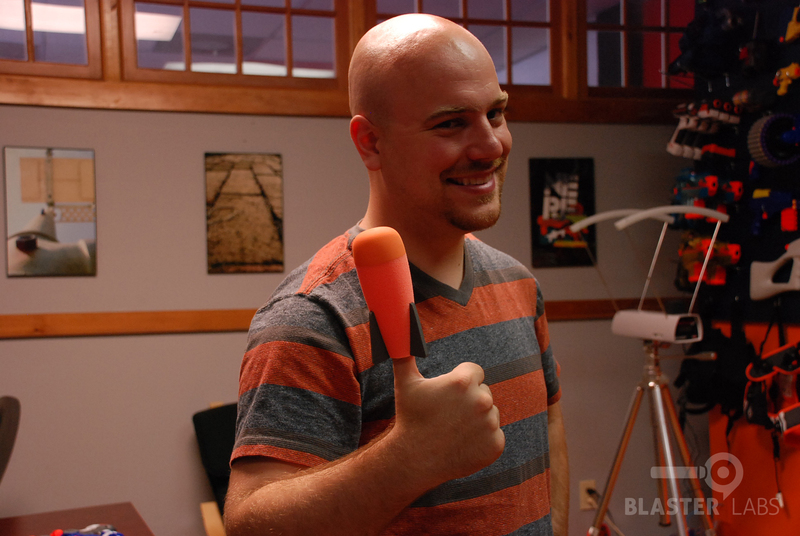 Fortunately, the low-mounted missile pumping handle is comfortable and easy to grab, providing a natural spot for a second hand. 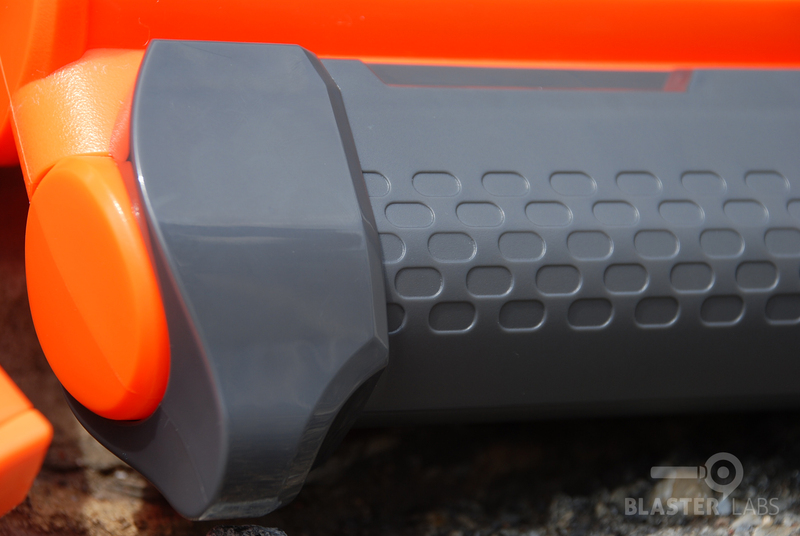 As expected from a Nerf product, the main handle is comfortable and well-sized, with an “acceleration trigger” mounted right below the main firing trigger, and directly across from the conveniently located clip release. The top-level tactical rail doubles as iron sights, but is largely useless if the detachable shoulder stock is being used to carry an extra missile (which, itself, is a pretty cool idea). 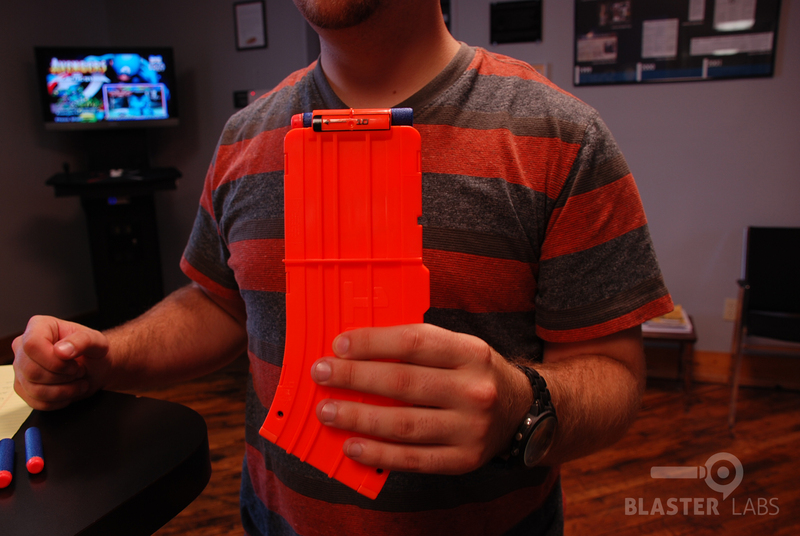 But speaking of useless, the cool-looking banana clip can only hold 10 darts, as we’ve reported previously, though that can easily be remedied by switching to a higher-capacity clip. 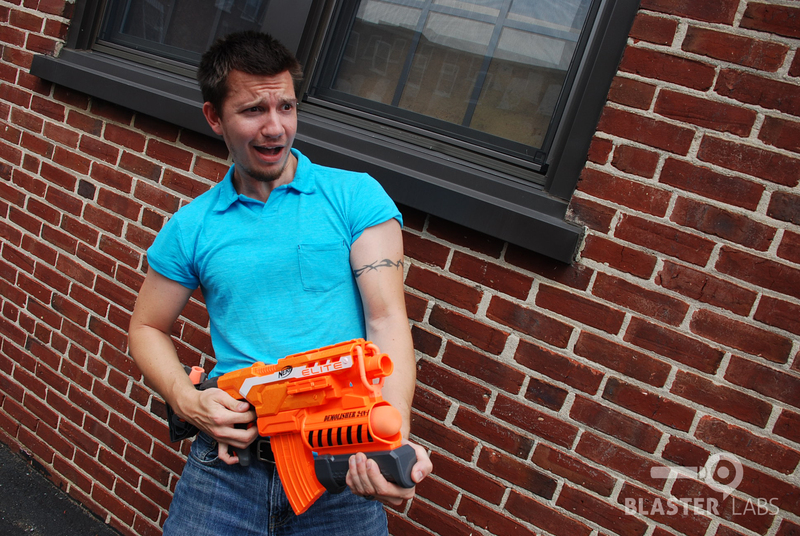 The shoulder stock itself attaches very solidly, and is nicely designed. 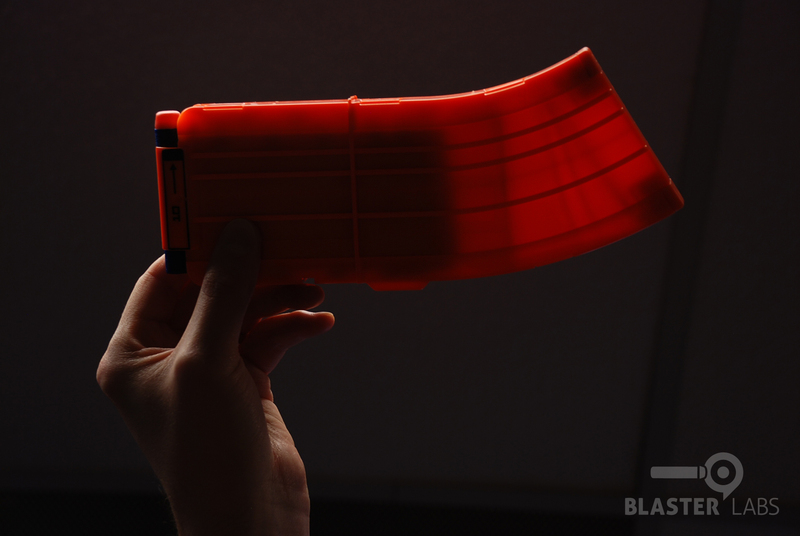 With the under-mount missile launch and the AK-style banana clip, the overall aesthetic of the Demolisher is edging closer and closer to mil-sim… and we love it! 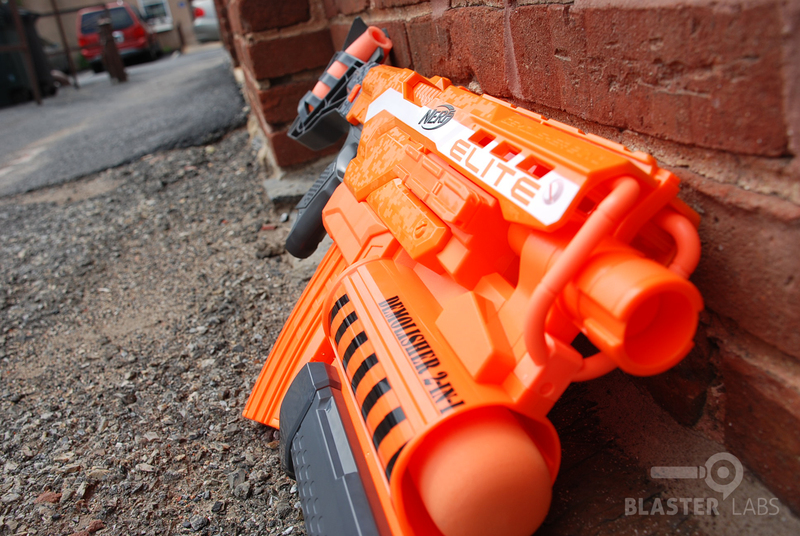 And although Nerf has essentially indicated that the only reason for the all orange motif is for shelf recognition (to help the new product stand out from all of the older Elite products), we’re generally ok with that, too. But if there’s one down-side to the nearly monochromatic color palette, it’s that there seems to be at least three different colors of orange being used–one very vivid, one more like salmon, and one bordering on pink. 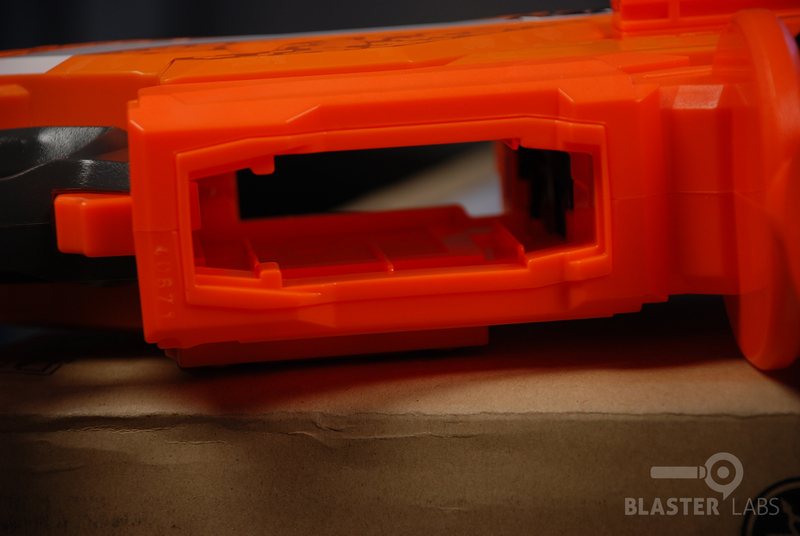 The actual product looks decidedly different than the illustration shown no the front of the box (which has one orange that borders on red, and another orange that is basically a very different shade of yellow), with colors that are too close to each other to look like anything other than an accident or a quality-control issue. Perhaps this will get worked-out in future versions of the product. 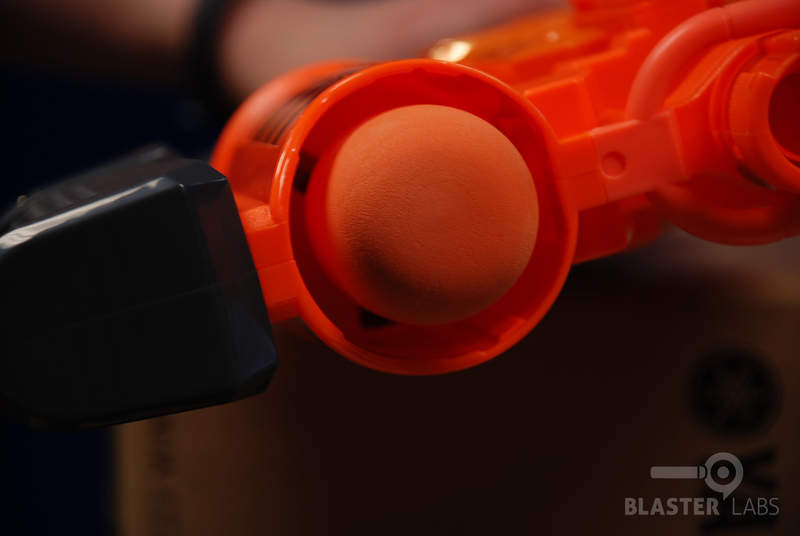 It doesn’t show-up well in our photographs that are highly saturated, but in real-life, some of the oranges are a rather sickly flesh-like color, including the foam used for the missiles and the small clip attachment points. Yuck. 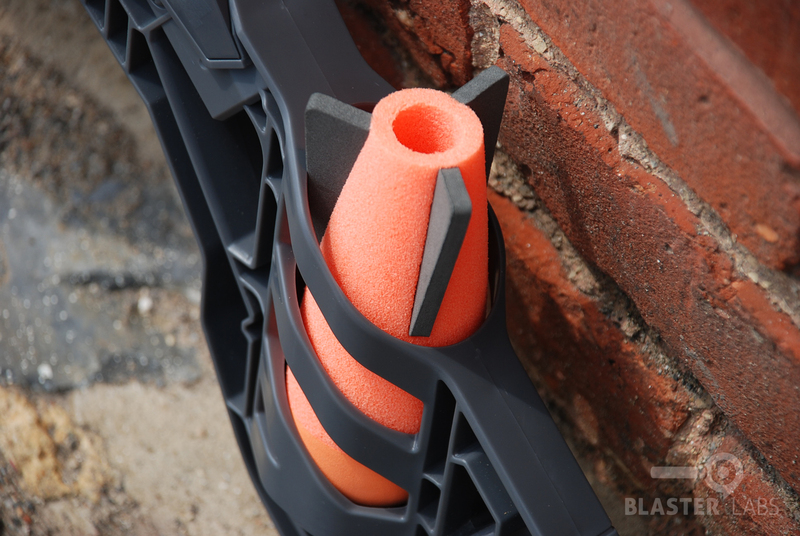 Aside from those aesthetic issues, we found little to criticize in terms of design and ergonomics, with the Demolisher being quite easy to wield and operate overall. Everything is where you would expect it to be, and there aren’t any surprises in terms of locks or weird loading techniques. 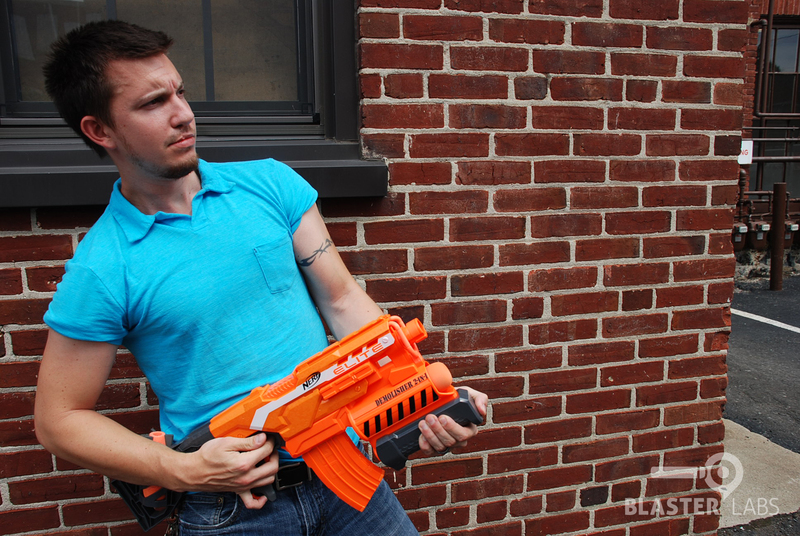 Setting aside the Demolisher’s look and its intimidating name, what really matters is how this blaster performs. 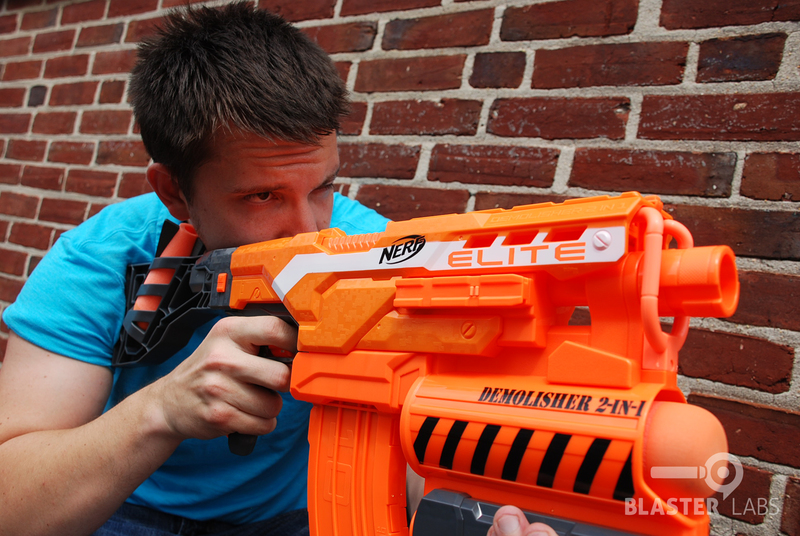 The Demolisher was the first 2014 product to be introduced as having extra-Elite ranges (which Nerf calls “Elite XD,” for “Extra Distance”), which is anything over 75 feet. 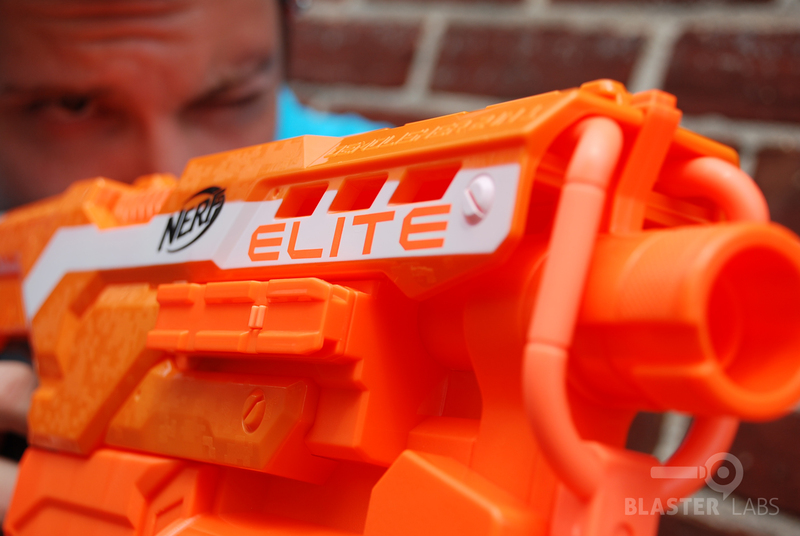 For whatever reason, we’ve never really been able to achieve even 75 feet with regular Nerf Elite products, so we didn’t have particularly high hopes of achieving “XD” ranges here. Sadly, we were not proven wrong. Our maximum recorded distance with our sample Demolisher, a fresh set of Duracells, and a fully controlled (indoor) environment topped out at 70 feet. Our average ranges hovered around 63 feet. 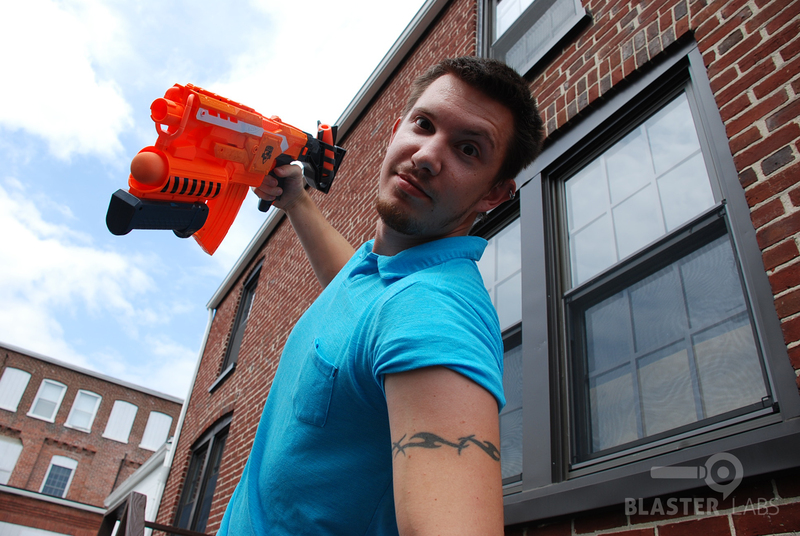 With the under-mount missile, we reached a max of 53 feet (and no, it can’t fire Mega darts). These ranges are good, no doubt, and perhaps with just the right arc and a little breeze at your back, something close to 90 feet may be possible. But we tried and tried, and simply couldn’t come anywhere close. Fortunately, that’s not where the story ends. 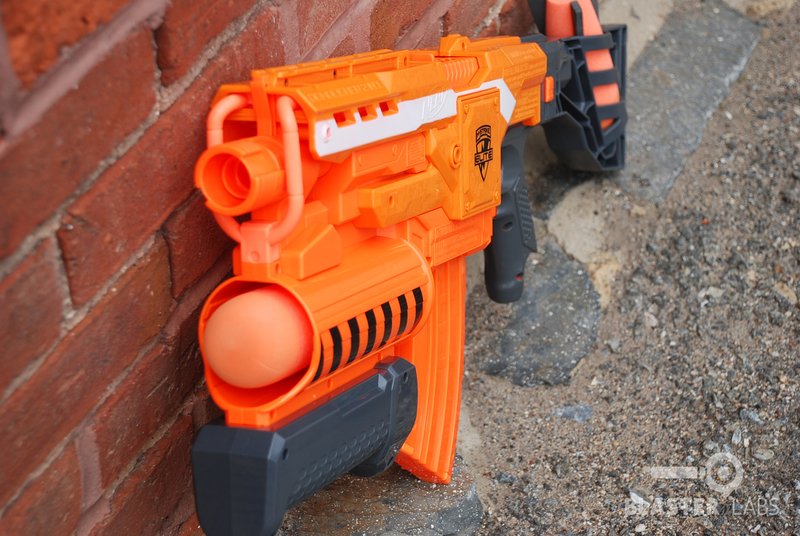 In taking our standard rate-of-fire tests, we were surprised to see that the Demolisher was able to belt out a very impressive 4 darts-per-second (we emptied the entire stock clip in just over 2 seconds). In addition, the actual speed of the darts when tested with a chronograph came out to an equally impressive 73 feet-per-second (with a low of 69 and a high of 77). Unfortunately, this acceleration appears to come at the expense of dart damage. 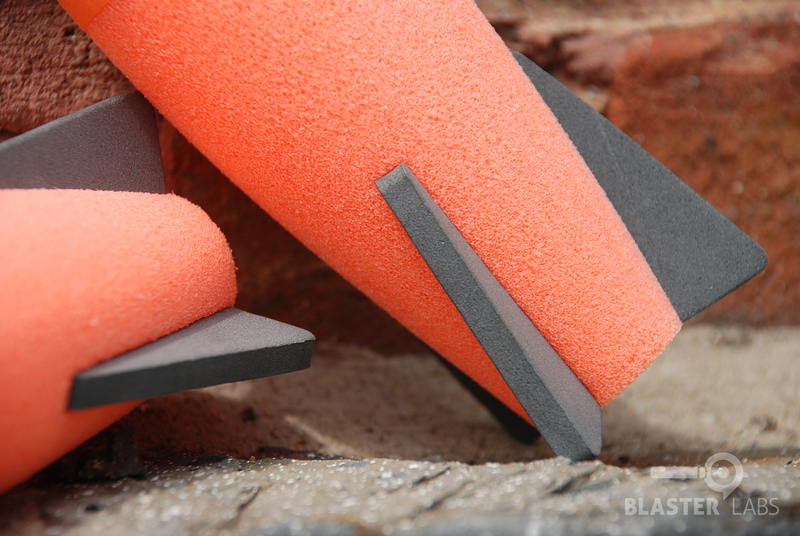 In attempting to figure out why we weren’t hitting longer distances in our range tests, we discovered that the heads of our Elite darts were being eaten by the Demolisher’s flywheels. 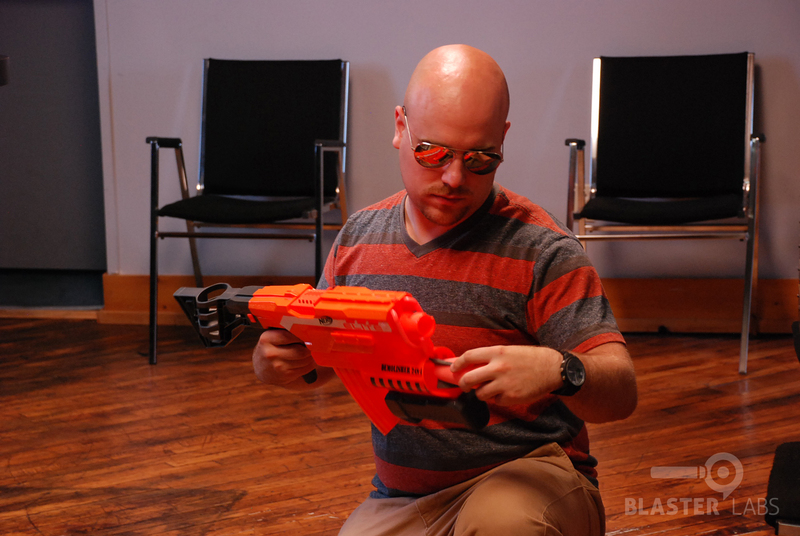 We’re not sure what kind of long-term effects that will have, but all of our darts come out worse-for-wear after having been used in the Demolisher. Caveat emptor. 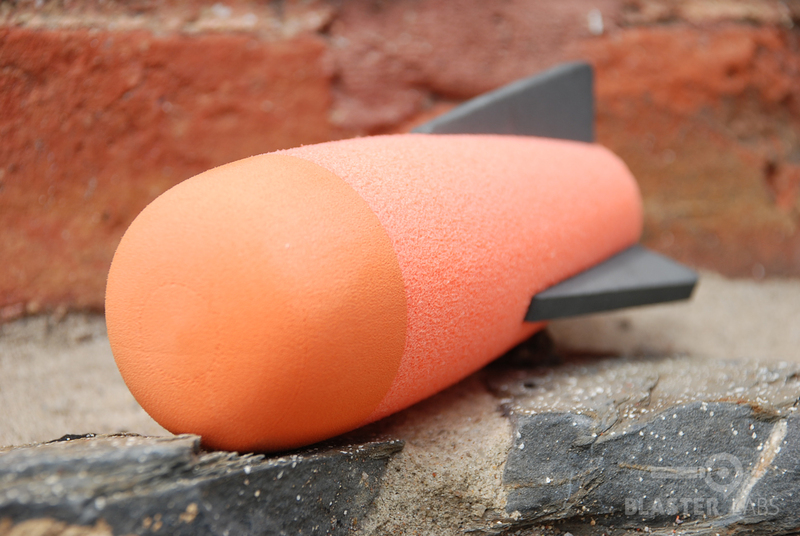 Though less important to note, the missiles came in at an average of 50 feet-per-second, which is largely dependent on the user. 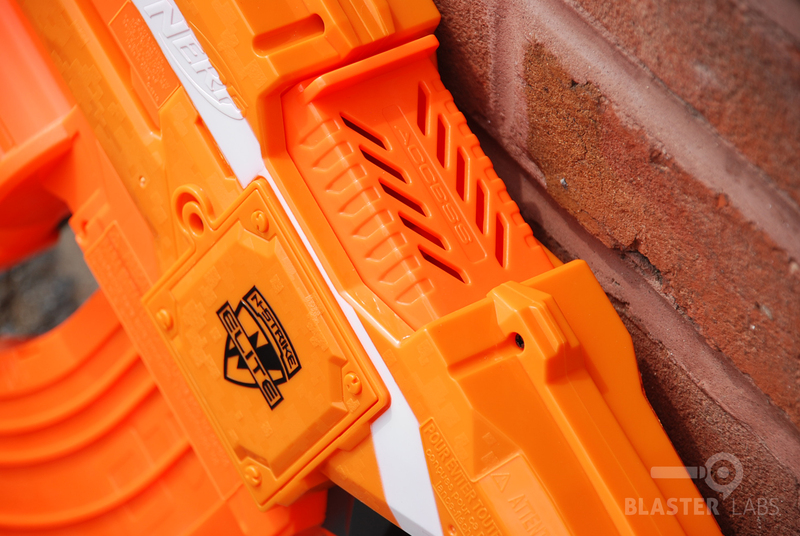 We found the accuracy of the Demolisher to be better than most Nerf products (especially versus a Slingfire that we were testing at the same time–the Slingfire was literally all over the place, whereas the Demolisher kept things fairly tight overall). Missile shots weren’t super-accurate, but they were at least entertaining, and the audible “pop” when launched is just hilarious! So, no, the Demolisher didn’t smash any distance records, but it still performed solidly versus other Elite products, and was generally pretty accurate. 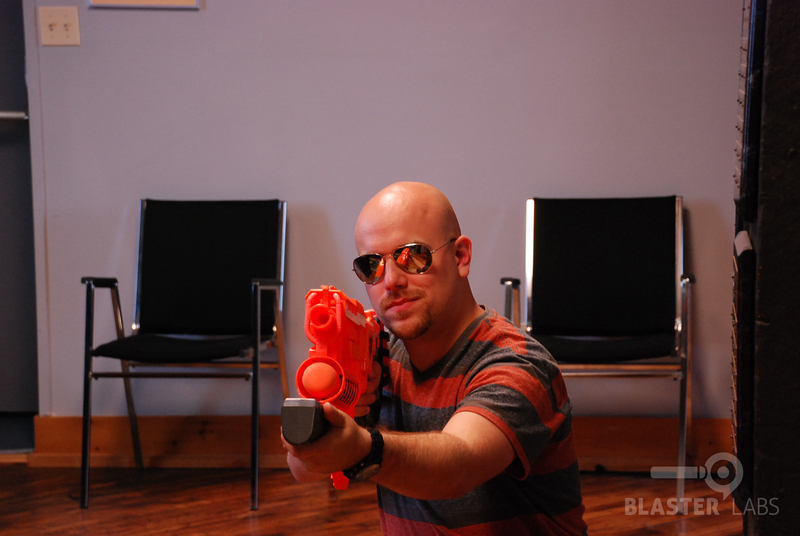 It was also very quick to fire, and darts have good speed and impact. 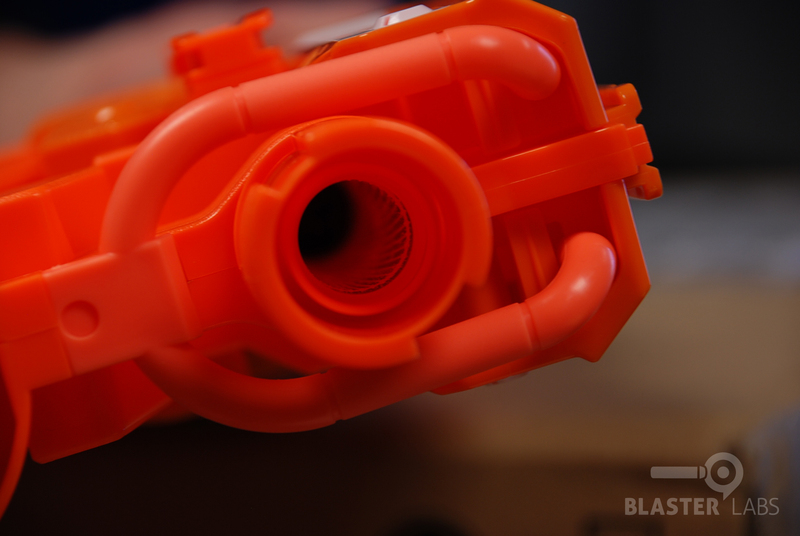 We did experience some jamming–typically the first shot of a full clip would do something funky–but it didn’t hamper the experience significantly, and jams were easy enough to clear. Here’s where things get interesting. 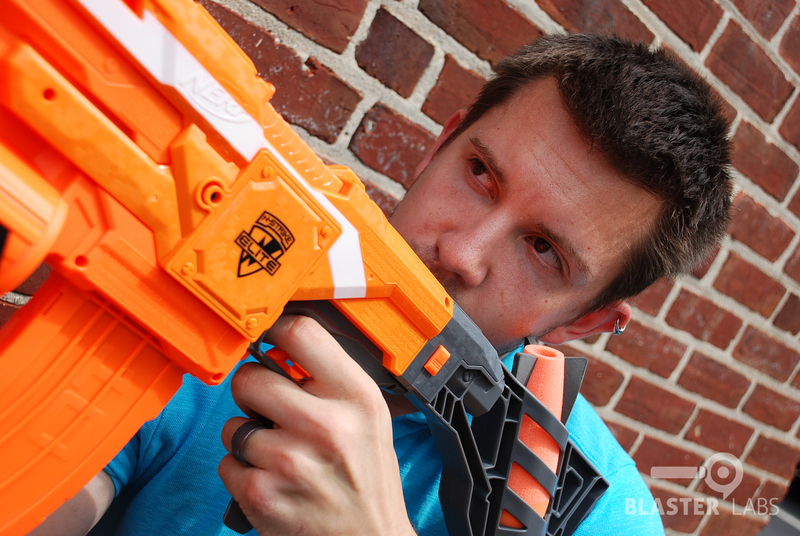 We honestly expected the Demolisher to be one of the best blasters we’ve experienced in a long time. And in many ways, it was. But it didn’t quite perform to manufacturer claims, appears to have some quality control issues with color matching and some dart jamming, and could be priced a bit lower ($34.99 seems right). That being said, it does perform well overall, and modders will likely find much to like. 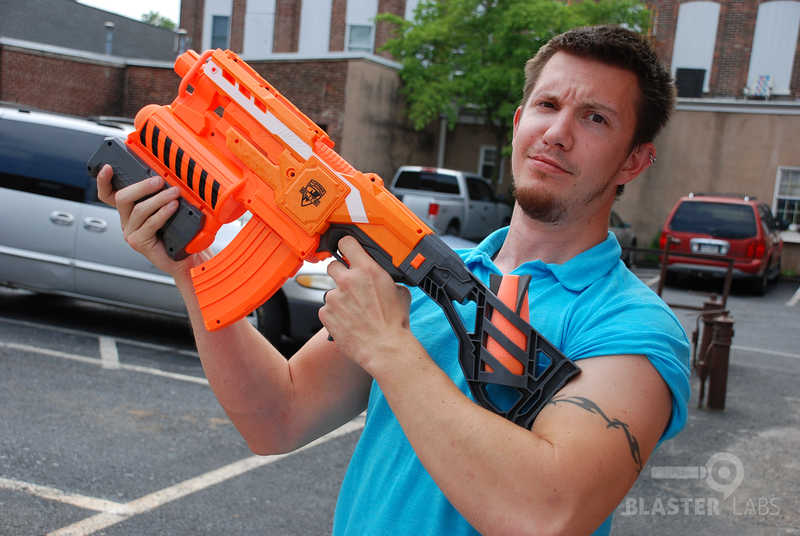 We also appreciated the removable shoulder stock, though the fact that the missile launcher isn’t also removable is a missed opportunity, and one that lowers the value equation considerably. 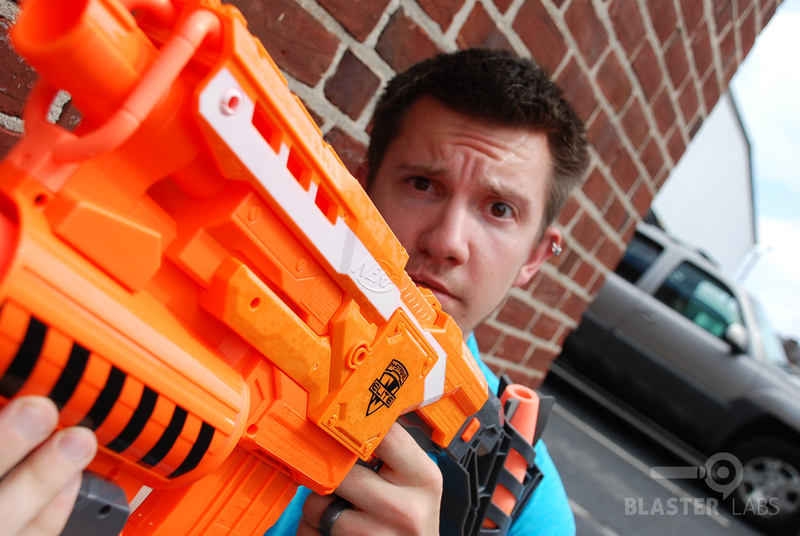 So, is the Demolisher the Nerf enthusiast’s dream come true? Not quite, but it comes achingly close. 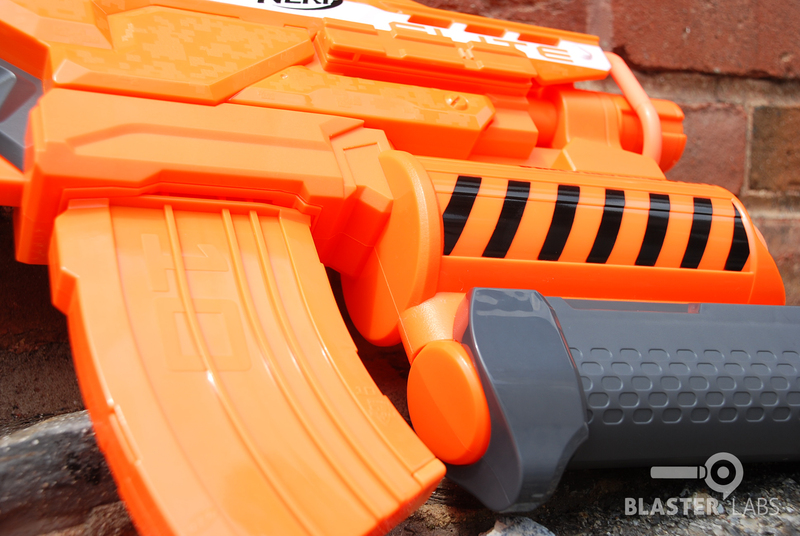 The tactical look is exactly what we want, the performance is definitely improved, the new missile launcher is fun, and the ergonomics and general build quality are up to typical Nerf standards. There are a few niggles that hold it back from being “perfect,” but nothing that should keep anyone from putting the Demolisher on their wish list. 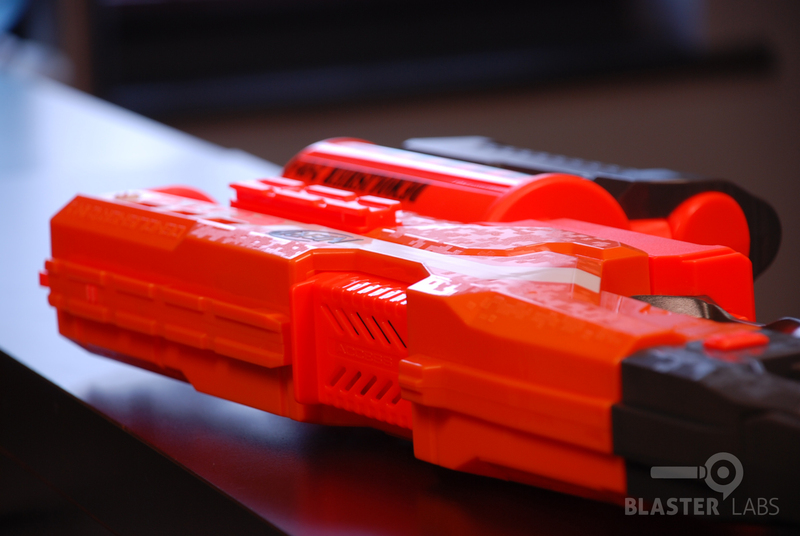 We’d love to see Hasbro continue to iterate on designs like the Demolisher, with even greater modularity and tight controls on quality and performance. 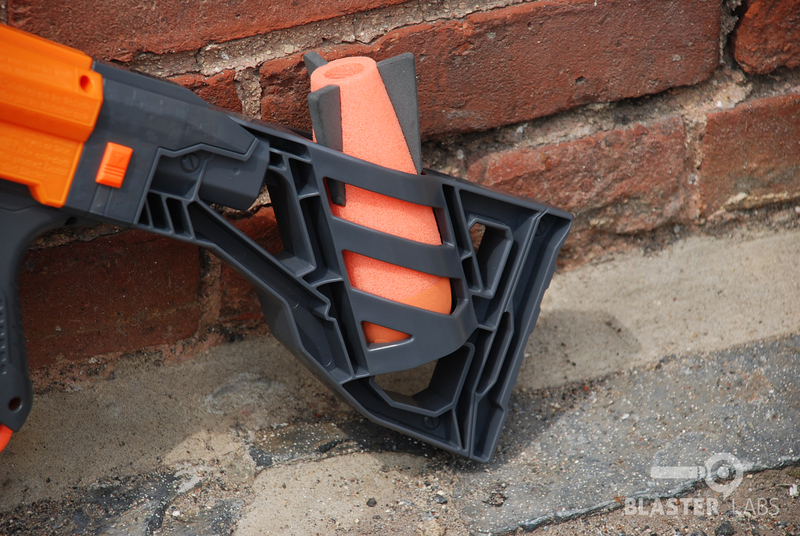 The Demolisher is an awesome step in that direction, and we’re excited to see what comes next! 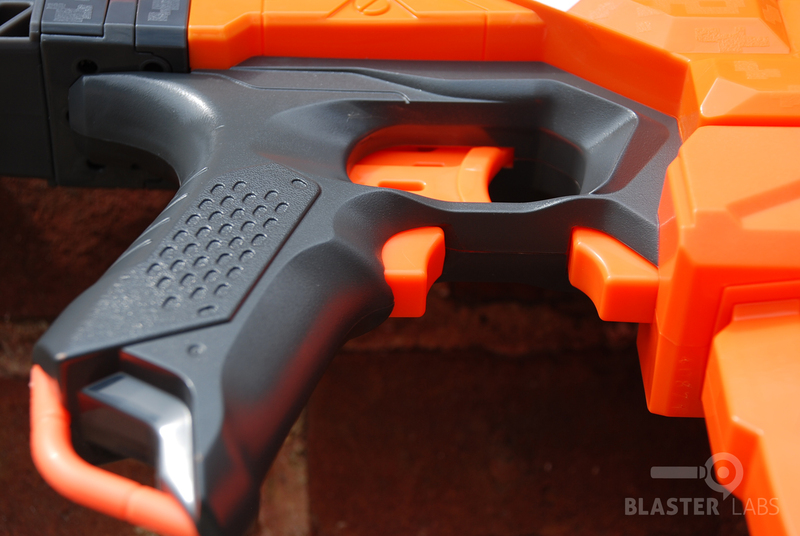 This entry was posted in Dart Blasters, Reviews and tagged 2 in 1, demolisher, elite, hasbro, nerf, review on June 30, 2014 by PMindemann. looks cool cant wait to get mine! those coloring issues will probably bug me though. 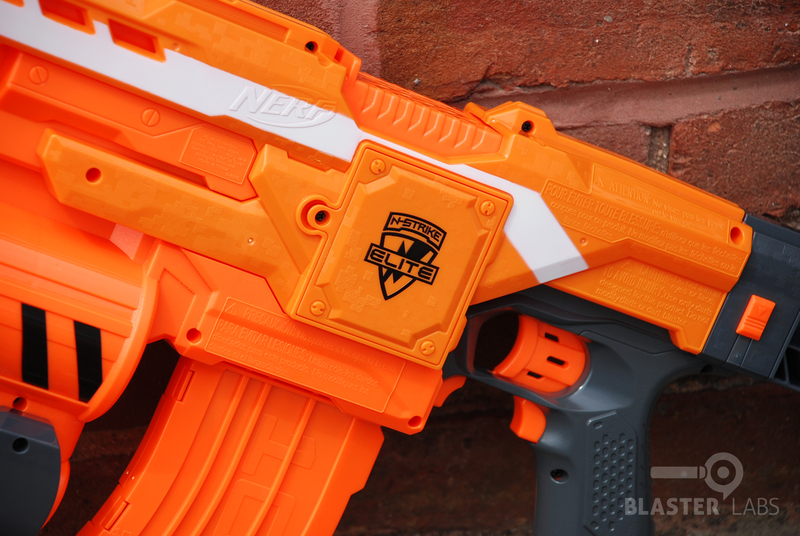 how does the fire rate compare to something like a stryfe or rapidstrike? Wow it looks awesome! I was wondering how far the pump rockets fire? 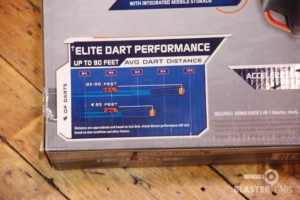 It says up to 90 feet on the box but I think that is talking about the range of the elite darts. any input? I feel bad for saying this but if I get one I’m probably gonna break it trying to saw that goofy looking grenade/rocket/whatever launcher at the bottom off. Seriously Hasbro, you were so close. Subtle racism is subtle. But it isn’t racist if the object of derision is white, right? Speak for yourself, normal people don’t care. Normal people would get upset that you think it’s funny to single out a person on their race. 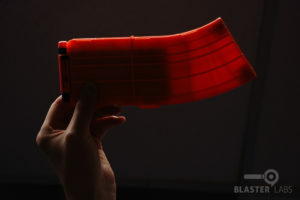 can I put a drum mag in this?